Parsons Green is another stabling point for the District Line and, until quite recently, was also a train crew depot; the latter function has now transferred to Earls Court. At first sight, it doesn't appear all that complicated - there's trains travelling to and from Wimbledon and a few sidings. But it's a very complex area, from a Train Operators point of view, and historical reasons increase these complications even further! Most of the possible moves (which take place at the start and end of traffic) are done by Earls Court Train Operators, but all T/Op's have to be familiar with them all. It's quite a challenge, both for a T/Op to get to grips with them and for an Instructor to get the knowledge across, and the logic (?) and - to an extent - past history has quite a lot to do with current procedures. At first viewing, there are 'only' about six sidings, but closer examination (and local knowledge) actually reveal that there are nine 'roads' onto which trains can be directed. Multiply this by at least two (and often more) 'moves' that can be done from each of those roads and the final total is into the twenties! This complexity is I think illustrated in that I have to reproduce two diagrams for the area! The first covers the station itself and the sidings to the west of it, but the second (towards Fulham Broadway) also needs to be taken into account. It's not necessary for me (or interesting for you!) to go through all the possible combinations of possible moves here, but I'll give a few examples with the photos that follow. This is the view from Parsons Green westbound platform looking towards Putney Bridge. In this view the following are visible, starting from the left of the picture: 21 Siding, 22 Siding, westbound 'main' (through line), eastbound 'main', 23 Siding and, to the extreme right, 24 Siding. A train at this position can move into any of these sidings when the shunt signal WF9 clears. The theatre type route indicator above the shunt signal will indicate to which siding the train is routed. I mentioned earlier that there are some historical factors concerning the arrangements at Parsons Green. One of these is that, unusually, the signal operator at Earls Court can set a route for a train to go to an already occupied siding. The Train Operator must, therefore, be alert for this and, should it happen, contact the signaller to tell him of his error. I will return to the reason for this later! It is also possible for a train to be reversed from the eastbound platform into any of these sidings; you may note that in the bottom centre of the picture there is a set of points which will not only allow trains to exit 21 and 22 sidings onto the eastbound line, but there is also a shunt signal (not visible) which allows the opposite to occur. If a train were to go from the eastbound into 23 and 24 sidings the shunt signal just visible about right centre would allow this to occur. This is a closer view of the same signals, WF2 (the station starter) and WF9 as described above. This picture is taken from 21 siding looking back towards the station. The top of the shunt signal is just visible and its associated theatre type route indicator is visible. This signal allows three possible moves; to the eastbound platform, to the westbound platform and also to 29 siding which is straight ahead of us and is located 'behind' the westbound platform. This siding is quite short, and can only accommodate C Stock trains. Another point that a Train Operator has to remember if he were to be signalled to the eastbound platform is that the train cannot enter passenger service at this point; when the train is at the normal entrainment point the rear car is not fully berthed, so there is the possibility of a passenger falling between the train and the platform. The train would enter service at Fulham Broadway. This is taken from 23 siding again looking east towards the station. Trains from this position can be moved to either the east or westbound platforms. To our left from this picture is 24 siding. Again trains can be moved to either the eastbound or westbound platforms, but additionally can be signalled 'straight' ahead into 31 siding. 31 siding can just be seen 'behind' the eastbound platform in a similar way to 29 siding on the other side of the station and as described above. However, this siding is very short and has no traction current rails; an engineers loco might fit on it, but that's about all! Under no circumstances would a driver accept that route if it were set for him. To the east of the station are three further sidings, though the picture suggests there are two. Strictly speaking there are two separate numbers to this one long siding, 25 and 27 sidings, but have for years been known as 27 'top' and 27 'bottom'. These sidings (to the left) can accommodate two trains; this shows 27 'bottom'. The yellow walk board visible in the centre of the picture is the limit of the train's move onto this siding. 28 siding is visible to the right; this accommodates one train and is accessed by a 'wrong road' move from the westbound platform. This is looking in the opposite direction, back towards Parsons Green. To the left is the exit from 28 siding back onto the westbound line; to the right can be seen 27 siding - 'bottom' as far as the walk board, 'top' (or more correctly 25 siding) from the walk board back towards the station. The passing D Stock helps gives an impression of the length of the siding; it is sufficient to allow two D Stock trains to be stabled on it. This the headwall of the eastbound platform, decorated with the usual collection of signs. The sign 'D OFF' indicates that de-icing equipment should be switched off; if it were to be used the sign is reversed and then reads 'D ON'. But of more interest is the black box just beneath it. This is a Headwall Tunnel Telephone and this device can be used to discharge traction current in an emergency. These are normally only installed in tunnel stations, as the name suggests, but there are a few open section stations which have them too. This is the view from the westbound platform; note just to the right of the arriving D Stock is a mirror; this allows a Train Operator to have a view of the platform before commencing the 'wrong road' move down to 28 siding. The shunt signal is just visible below the mirror to allow the move. Finally, I return to the reason why it is possible for a potential conflicting move to be signalled by the signaller and this photo actually gives a clue to it!. You may be aware that in the past London Underground trains routinely uncoupled to run in shorter lengths during off peak times on many London Underground lines. 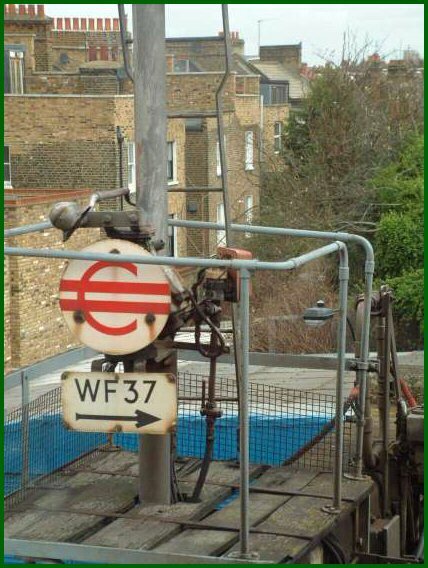 This signal is a 'Calling On' signal which has now been out of use for over 30 years. It is all part of the uncoupling procedure, and allows a train to be drawn forward into an already occupied section. This is also the reason why this apparent conflict situation can still arise today. Tubeprune has an excellent explanation of the process which can be read here. If you've read all this you might have noticed from my description that there is no reference to either 26 or 30 sidings, nor are they illustrated on the signalling diagrams either. The reason for this is that they don't exist! I'm sure they must have done at some time, but I've not spoken to anyone who knows where they were. If anyone's got any old diagrams or photographs of the area with them shown I would certainly like to see them! So, that's Parsons Green and some of the possibilities of what can be done there; I think you may now understand why I say it's complex!